Problem reaction solution, the Hegelian Dialectic is that process the globalist ruling class have chosen to use as the primary tool to constantly change society in the direction they want it to go. They manufacture a problem, focus on that problem, then sell the solution. The solution is always the very thing that drives their plan forward. In this day and age the fundamentals of basic knowledge and awareness of what is happening in the world can be gauged by someone's awareness of the Hegelian Dialectic. If someone is not aware of this powerful tool used by the controllers it is likely they are not aware of a lot of other things. For this reason the basics of the Hegelian Dialectic cannot be underscored enough in explaining major agendas today. Let's look at 6 absolutely engineered problems today whose solutions play perfectly into the new world order plans. No one should mistaken these for anything other than manufactured problems without which there would be no new world order. 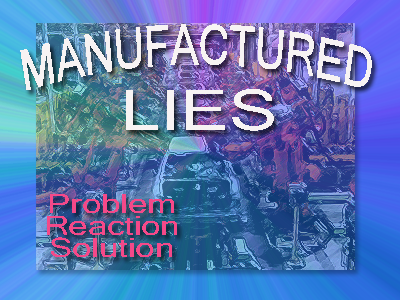 For this reason the following manufactured problems will never be solved. These manufactured problems are required and we should expect them to go away any time soon. 1- Deliberate geoengineering of climate quietly behind "climate change"
The global warming movement has been debunked many times over by non-government/non-IPCC funded scientists, researchers and critical thinkers all over the world. As a result of this, by the turn of the new century the movement had to change its name to the broader more generic "climate change". Here we are many years later and the earth never warmed like it was supposed to. But don't get any ideas. Those deeply committed to the climate movement will not be moved by facts or logic that interfere with their position on the matter. Meanwhile the controllers know that to admit that the planet is not warming would put the future of geoengineering in jeopardy. Government geoengineers for years have been planning the roll out of the geoengineering global operations to the general public and they know the only way to do is to justify it under the global warming "problem". In this script they've been working on for years geoengineering is the "solution" to the climate problems. Geoengineering meaning the spraying of our skies with chemicals and the additional injection of our skies with chembomb aerosol massive plumes in conjunction with HAARP to manipulate the weather among other things. This agenda is so important to the globalist that no movement has been more infiltrated with what I call cross-confusion, as much as the geoengineering movement. Over the last few years we've seen outright global warming hoaxers positioning themselves (in some cases) in perceived leadership positions just to lure those active in the geoengineering movement into alternate confusing narratives where in order to supposedly understand the problem of geoengineering the followers are being deceived into accepting the Al Gore, UN, CFR, Rockefeller, Club of Rome's long planned global warming hoax theories. In this particular topic the globalist have thus attempted to create a two-layered deception and it goes something like this- The "problem" (problem A) of global warming has led to the "problem" (problem B) of geoengineering. But since global warming is real let's see how we can make the geoengineering a more responsible kind of geoengineering or maybe we'll stop the geoengineering and use the stopping of geoengineering to confirm the need to address problem A, the global warming hoax. Does this remind anyone of the left-right paradigm where you have to pick the better of two evils? No ISIS means no new world order. The globalist know this, so as I suggested some time back, the primary goal for the global elite is to simply prolong the existence of ISIS and make them sound greater than they are. The logic we are told suggests that ISIS is a powerful always growing uncontrollable force and thus the solution to this problem is to keep and expand the war on terror, keep attacking other nations in the name of fighting ISIS, and continue being afraid of ISIS even if it means ignoring the fact that the U.S. and its NATO allies created, funded, armed and continue to arm and support ISIS. This reminds us that the globalist will never let reality get in the way of their script. The script always comes first, then the interpretation of reality follows. Anyone bothered, disturbed or resisting this cultic reverse logic where the interpretation of reality is secondary to the customized version of their script opens themselves to being labeled a "conspiracy theorist". Yes, the script to suppress knowledge and keep the masses in the blind has not changed, we all know the rest. All over the nation the local police are sitting on tons of military gear given to them by the Federal government under the 1033 program of the 1990's. It's one thing to have military capability, it's another to actually show it off and get the masses accustomed to the police state so they can see what happens when you resist. We're talking mass conditioning which is very important to the new world order plans. They need a public which has learned to accepted their submissive role at the hands of an aggressive, fully armed, federally militarized nationwide police state. In almost every police show of force which has followed the latest police shootings or injustice we've seen suspicious provocateurs inciting violence. This is common in staged or co-opted revolutions and no one should be surprised. Sometimes the reason for the revolution may be genuine but the participants unfortunately don't realize how the likes of George Soros are funding many of these events forcing one to wonder how these revolutions fit the bigger picture. George W Bush summed it up best with the phrase "order out of chaos". This is all part of their plan to destabilize nations including America, cause revolutions then role out THEIR solutions to the problems. We've all watched how the Obama administration has worked hard to manufacture the new propaganda cold war against Russia and Vladimir Putin who have not marched along with the globalist new world order plans and the western debt based dollar banking scheme. We all know the script by now. You don't play along with the western banking cabal and you automatically get demonized as the new boogie monster. Russia knows full well how this works now after several years of propaganda, lies, accusations, territory wars in Ukraine, and the colossal failure of blaming Russia for the downing of MH-17 in 2014. The end result is that Russia has become the new bogey-monster in the eyes of CIA's western mainstream media. The latest version of the ISIS psyop show propaganda even includes new suggestions that somehow Russia is with ISIS! With few being fooled by this political foreign policy, CIA driven, 1950's style resurrected anti-Russia propaganda the script rolls on. The new "problem" is Russia. This is the perfect manufactured problem to slowly lead us to the planned WW3 scenario the globalist have been thirsting for. This is "order out of chaos" to the third power and a very important part of the global Hegelian Dialectic staged "solution" to usher in their new world order. We've seen the periodic health and disease hysteria. They come and go before you even notice. Remember the Ebola hysteria of 2014? Did anyone ask the simple question- how and when did Ebola go away?? The answer is it didn't. CIA's mainstream media removed it from the news voluntarily. The virus is still real and nothing has changed. What we are seeing in these modern days is a mainstream media which has the power to insert something into your mind suddenly with 24/7 media hyped coverage. When they do this then the topic they are covering IS the story that you need to worry about. This same mainstream media however has the power to magically make that same topic disappear from your mind. The effect is magical and instant. That's right, when the mainstream media says the crisis is gone then its gone regardless of what is actually happening. So beware of the next medical crisis. When it comes it will be because the mainstream media decided it has come. They will also decide if and when the story will go away. During the next disease hysteria "problem" expect them to use this tool to advance whatever agenda they have cooking. As the SB277 mandatory vaccination bill is on the verge of becoming law in California forcing all parents to subject their children to government dangerous and unproven vaccines, we shouldn't be surprised if this agenda is followed up by a new disease scare much worse than the not-so-scary measles hysteria of a few months ago or the 2014 Ebola mania. Keep in mind also that the control system is gauging the effectiveness of these early hype campaigns. They are measuring how the public is affected by these mainstream media 24/7 hysteria campaigns and they are taking notes on how to improve the script for next time. Now more than ever is the time to be alert, vigilant and aware of this informational propaganda war we are in for your mind and your body. Finally, the left wing section of the right-left globalist control system continues to push their Malthusian, elitist, Eugenics, master race planned problems of scarcity and overpopulation as well as the "carbon emission" hysteria which all traces back to the failed global warming hoax of the Al Gore days. The "solutions" to these scripted problems of course line up perfectly with their need to control the world by taxing and monitoring all human behavior worldwide as the world moves toward "sustainable" solutions. The U.N.'s long planned Agenda 21 is a major part of the implementation of these solutions to these scripted problems. And like all the other scripted problems above, anyone thinking critically, asking questions, exposing these agendas or pointing out what's wrong with these claimed problems or solutions is a "conspiracy theorist". Remember you are not allowed to interfere with these scripts. The problem MUST exist for the solution to be implemented. The "solution" must be implemented exactly as planned for the new world order agenda to move forward as planned. Is there any part of this script that doesn't make sense to you yet? What we are now seeing is a growing segment of humanity which is reading and educating themselves on the simple truth behind the new world order. As we see things get much worse every day now we are all reviewing and recognizing how this works. Make no mistake, as we share this basic knowledge about the new world order plans the simple truth becomes easier and easier to see. Ironically, the more the control system offers resistance to this human awakening with counter deceptive stories the more people wake up even if it's at the expense of those that are more blinded. If this story seems easier and easier to understand realize that this is the process of human intellectual evolution in motion. Let's therefore continue sharing this information for information sake and realize this is having an impact on the species, our consciousness and ultimately our road to freedom, more importantly freedom from the system of enslavement that threatens our current existence.